Swampscott Little League offers baseball and softball programs for children age 4 to 16 years old. Which League Should My Kid Play? 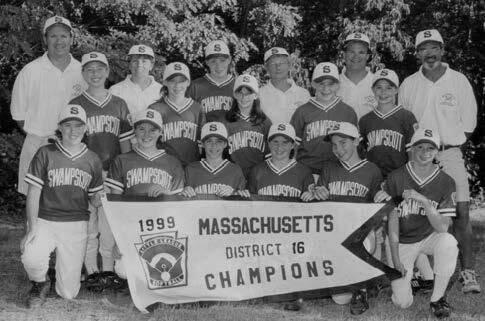 The Swampscott Major Girls Softball All Star Team won its first state championship in 1999. The team (shown with their District 16 banner because the state banner never arrived) included manager Rob Wadden (far right) and coaches (left to right) Rich Bane, Barbara Klein, Roberta Bufalino and BCollier. The players were (front row) Mae Karkowski, Becky Paskievich, Ilana Cooper, Jacqulyn Collier, Nikki Vousboukis, Marisa Fields and (second row) Gina Bertolozzi, Alison Fuller, Ashley Wadden, Lexie Zell, Halie Bane and (third row) Meagan Barbuzzi. The girls won the championship in a 5-2 win over Joe Schwartz Little League Worcester in a game played in Gardner. 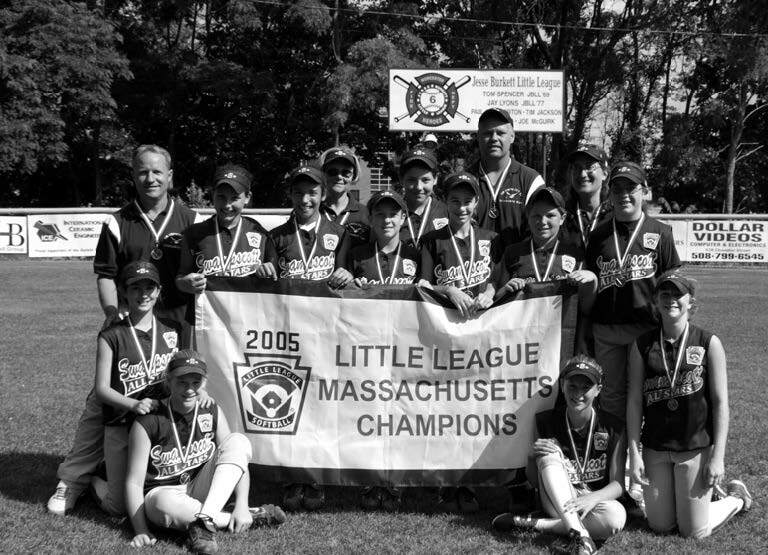 In 2005, the Girls Major Softball team, managed by John Vinal with coaches Eve Gambale and Scott Bragan, again won the state championship and got within one game of going to the Softball Little League World Series in Oregon. The team won 11 games in a row before losing 2 of 3 in the Regional Tournament in Albany, New York. The skill and spirit of this team was simply remarkable, and the coaches and players were amazed at how many people from town drove to Albany to cheer for the team in the Regional Tournament.